The Astros in Seattle were also probably sleepless in Seattle (see what I did there?) as they arrived at around 4am, after finishing a late one against the BoSox last night. This represented the first game against any non-Rangers AL West opponent on the season, and with the results going how they have fallen in the AL West, the Astros are not too far behind any of the leading teams. This shapes up as a critical road trip, because after this, they head south to Oakland. With a hot road trip, the Astros can get within whispering distance of .500. Instead, the Astros crash to the (equal) worst record in the AL, tied with the Twinkies (who lost their first nine in a row, if you remember), falling to 6-14 on the year. This came courtesy of a 3-2 loss - another one run game which the Astros again failed to come through in the clutch. They faced a tough starting pitcher who was on his game tonight, but again (in a microcosm of their season), they played well enough to finish within spitting distance, but not well enough to win. Their ninth inning encapsulated things perfectly, but we will get to that soon enough (although wiser readers would be well advised to avert their eyes). Doug Fister was coming off a strong outing (although a loss) against the Rangers, which was also nearly certainly the best outing for any starter the last time through the order. And, lo and behold, he managed to face the minimum in the first after walking Aoki, with a couple of very close pitches called balls instead of strikes. A Seth Smith double play erased both himself and Aoki, and Robinson Canó grounded out as Astros fans everywhere breathed a massive sigh of relief. First innings have not been kind of Astros starters this year! Fister inherited a lead in the bottom of the second, and issued a leadoff walk to Nelson Cruz. However, the next three batters went down on a strikeout swinging and two line drive outs. A lead-off home run in the third, hit just inside the RF foul pole by Leonys Martín tied the game. Kratz called for a pitch down and away, Fister missed glove-side-and-up, and Martín golfed a pitch that landed about 20 rows in the RF stand, just fair. Fister wasn't done there, in terms of baserunners in the third. He allowed two more walks - and if you are counting at home, that is four walks in three frames at this point - but neither runner scored. Another home run conceded with one out in the fourth broke the tie - this time Kyle Seager was at the plate, and again Fister missed glove-side-and-up on a sinker down-and-away. This shot escaped the yard by around 2 rows in the RF power alley, and the Mariners had a lead they would not relinquish. I thought Fister was a little unlucky in the fifth. Ketel Marte singled over a drawn-in Valbuena to open the frame, then with one out, Seth Smith walked. I was watching the online feed on GameDay at the time, and there were two strikes that were listed as balls. I think the GameDay strike zone varies depending on the height of the batter, and Fister seemed to be hitting the corners, but not getting the calls. But why speculate when you have Brooks Baseball?? Note that Brooks Baseball has the standard strike-zone plot in place, and that lists the top of the strike zone at 3.5ft off the ground, whether 6'3" Seth Smith or 5'3" José Altuve is batting. So those two high pitches were recorded as strikes on GameDay but balls on Brooks. But hey, at least the ump was being consistent. At least in that at-bat. Two more walks in the sixth, this time with two outs, but Ketel Marte lined out to LF to end the frame. For those still keeping count at home, Fister walked seven in six innings. 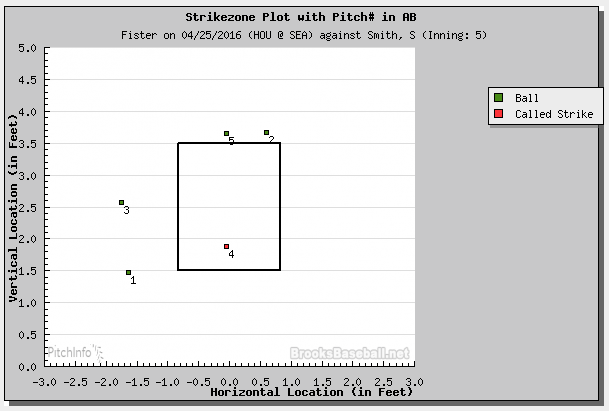 Not good, but a tight strike zone may not have been his friend, as discussed above. The Astros 'pen was stellar again, in a losing effort. Fields struck out two in a perfect seventh - his second strong outing in a row - and Harris was brutally efficient in retiring the side on two grounders and a line drive out. Fister's final line of 6IP, 4H, 3R/ER, 7BB, 2K, 2HR could be argued either way - an outing when he worked effectively around baserunners, or lucky to allow 11 baserunners in six frames, but only have three touch home plate. Lots of hard-hit outs, right at fielders, too - I think it could easily have been a six or seven run affair. But there is a non-zero chance that Fister's effort is again the best the next time through the order, especially if the assessment is based entirely on earned runs alone. Taijuan Walker has been pitching well this season, and tonight he had another strong outing. However, the Astros scraped together enough offense to make a game of it, and arguably should have scored enough to tie the game. The Astros went in order in the first, but managed to score a single run in the second to take a lead. Tyler White walked on four straight pitches with one out, then went to second when Evan Gattis hit a hard single the other way. Also hitting a hard grounder the other way, and just out of the reach of a diving Canó, was Carlos Gómez, and that was good enough to advance Gattis to second and score White. Valbuena and Kratz both stuck out to end the frame. Gómez's single was enough to turn the lineup over (in the absence of double-plays), so José Altuve led off the third. He singled just past a diving Ketel Marte, who took a little speed off the ball by nearly gloving the ball. However, the ball bounded into shallow CF, and Altuve took off for second. Leonys Martín was playing shallow, and he backed Marte up, so he was to the ball quickly. He fielded it about 20 yards from second base, and recorded the easiest outfield assist of his career, gunning down Altuve well before he got to second. Altuve smashed his helmet into the ground in frustration, realising that the Astros had been victimised by another baserunning TOOTBLAN. Sadly, not the last for the night, either. Evan Gattis "doubled" as the next baserunner with two outs in the fourth - Nelson Cruz butchered the play coming in - but Carlos Gómez hit a routine grounder for the third out. Erik Kratz reached on a bunt single with one out in the fifth, then Altuve doubled him over to third on a hard shot down the LF line. But Springer struck out swinging for the second out (splitter down), and Correa grounded for the third out (wonderful play by 3B Seager), and no runners scored (surprise!) despite two being in scoring position for the heart of the Astros' order. Walker then turned nasty, striking out the side in the sixth and seventh innings - four swinging and two looking. He was pulled to start the eighth - after 118 pitches - in favour of Joel Peralta, who found himself if plenty of trouble. Springer (1-4, 2B) doubled with one out, then Carlos Correa (1-4, RBI) singled to RF to drive Springer home, narrowing the gap to one. Peralta bounced back to strike Rasmus (0-4, 2K) and White (0-3, BB) out, stranding Correa at second (which he stole). The ninth was a microcosm of the Astros' season. Sidearmer Steve Cishek relieved, and he has made a career for himself pounding the strike zone low. Evan Gattis (2-4, 2B) opened the frame with a slow roller to third base for the first out. Carlos Gómez (2-4) followed with a clean line-drive single up the middle. Everyone in the ballpark knew that Gómez was off-and-going at some point, and on the third pitch of Valbuena's at-bat, he took off for second. Iannetta's throw wasn't especially good - it was a bit high, but Ketal Marte dropped the tag in time, when Gómez was still 18 inches short of second base. Caught stealing, and arguably another TOOTBLAN. It became more of a TOOTBLAN given what followed. Valbuena, (0-3, BB) with the platoon advantage, put together a great at-bat, eventually working a walk. Preston Tucker (1-1, pinch-hitting for the catcher, Kratz, who had earlier singled on a bunt base hit) then singled on a hard-hit line drive right at RF Nelson Cruz. The Mariners have had some awful defenders in the outfield over the last few years, and Cruz may be the worst. He totally butchered what should have been a shoestring catch, and pinch-runner González headed for third. The ball could easily have gotten past Cruz, or ten feet either side would have rolled to the wall, and the run would have scored. That put runners on the corners for José Altuve (2-5, 2B), who broke his bat on an inside fastball, and the result was a slow roller to short for the force at second. Game over, and Gómez's caught stealing loomed large. I don't want to be too critical here, but it is hard to score from the dugout bench, Gómez. If the inning had continued without the caught stealing (and no guarantee that it would have) the grounder could have scored the go-ahead run. At worst, the game would have been tied. But the Astros' overaggressive style costs them again, in my opinion. If you want to see an offense that is less than the sum of its parts, then this is it. Seth Smith's walk, detailed above. Perhaps this is getting picky, but the Astros pitchers - who got the better of the strike-calls in the final Boston game - need the home plate umpires to call borderline strikes to be effective. This is because they work off the corners so much, and none of the current starters could dent a pillow from 20 paces. The little things aren't breaking for the Astros at the moment, but they also could easily be .500 now without stupid fricking mistakes and better situational hitting, and a little luck with the umpires. Shoutout to Evan Gattis and Carlos Gómez, for two hits apiece. Some may see that is proof that even blind squirrels find the occasional acorn, others may see it as the two hitters starting to turn the corner. Gattis, Gómez and Valbuena - normally the 6-7-8 hitters, have combined for ZERO home runs this year. On an offense that is scoring >50% of its runs on long balls, that ain't good. TOOTBLAN's from Altuve and Gómez. Sigh. Thanks, great recap. I just can't stay up for these West Coast games. No doubt the Fister wasn't good last night, but the MLB schedulers were also pretty cruel to the Astros.